With the support of the Public Private Alliance for Responsible Minerals Trade (PPA), IPIS set up its Artisanal Gold Monitoring Pilot in Mambasa (Ituri Province, DRC) between April 2016 and July 2017. This involved developing a low-cost methodology to produce a continuous data flow on a wide range of indicators related to the operational, security and human rights context of artisanal gold mining. This methodology builds on and enhances the monitoring capacities and structures of local state agents and civil society actors. It allows capturing the dynamic nature of production and trading patterns along the artisanal gold supply chains feeding into an important trade hub. The Mambasa pilot demonstrates how production data and trading patterns can be systematically monitored at numerous individual mine sites feeding into the artisanal gold trading hub of Mambasa. The findings of the research are summarized in 3 progress reports and a final monitoring report. Download in pdf or open with issuu-reader. The final report is also available in French. The three progress reports are available here. One of the key complexities of artisanal mining in eastern DRC lies in the tension between its importance as livelihood for millions of Congolese and its central role in conflict financing. The last decade has seen burgeoning interest in responsible sourcing initiatives in DRC, particularly for the so-called 3Ts (tin, tantalum and tungsten), and an increasing demand for fair gold. Gold is however lagging far behind in these responsible sourcing endeavors. A number of its specific features – such as its widespread use as currency and high value-to-volume ratio – render artisanal gold particularly hard to capture or trace. At present, it is nearly impossible for downstream actors seeking to source artisanal gold from the region, to know with reasonable certainty that they are not contributing to conflict financing or serious human rights violations. In this light, the data produced by this pilot provides information on essential questions: Who is in charge of the mines? Is there an armed presence or interference? Does child labor occur? Are any human rights violations occurring along the supply chain? In the current vacuum of information on artisanal gold from Eastern DRC, this methodology thus contributes to the very first due diligence steps for those seeking to source from the region. It simultaneously stimulates and facilitates the implementation of responsible sourcing initiatives. IPIS believes that such a dynamic and sustainable monitoring methodology, rooted in local structures and capacities, is essential for responsible mineral sourcing in DRC. Rather than relying on snapshot visits or expensive technology, it involves local civil society and state agents in supply chain monitoring, to inform due diligence efforts, and to advocate for transparency of artisanal gold production and trade. IPIS sees three main achievements of this pilot project. Firstly, the project introduces a low-cost methodology to create a dynamic data flow, building on and enhancing local structures and capacities. IPIS hereby seeks to contribute to the on-going debate on enhancing transparency and traceability of artisanal gold supply chains in eastern DRC. Secondly, the data produced during this project gives detailed insights into the production and trading dynamics along the artisanal gold supply chains of 92 mines feeding into the Mambasa trade hub. This data is of interest to actors seeking to set up specific responsible sourcing initiatives or improve due diligence reporting. It is also useful to continue the on-going work of validating artisanal mine sites in eastern DRC. Finally, the data output of this pilot broadens understanding of the opaque world of artisanal gold mining and trade in DRC. It helps to understand the dynamics of this sector and thereby aid the multitude of actors and initiatives striving to improve the governance, security, socio-economic and human rights impact of artisanal gold mining. The data gathered during this project is available to the public in two ways: as a downloadable dataset, including a special selection of the most relevant data features of this pilot program, and through a dedicated webmap displaying the covered mining sites around Mambasa, where these features can be consulted through a popup window. 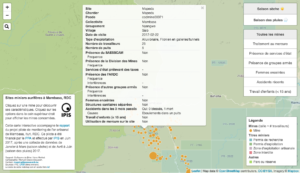 Note that this project’s data is also incorporated in IPIS’ larger Open Data initiative, and is part of IPIS’ general webmap on mining in eastern DRC. Parties interested in cooperating with IPIS to replicate this methodology as such or adapt it to the specific needs of their activities are warmly invited to reach out to IPIS.